Bunnies 1 Me 0 – But the game isn’t over. | EAT MY PLANTS! We saw a few Sunflowers were bitten clean off. 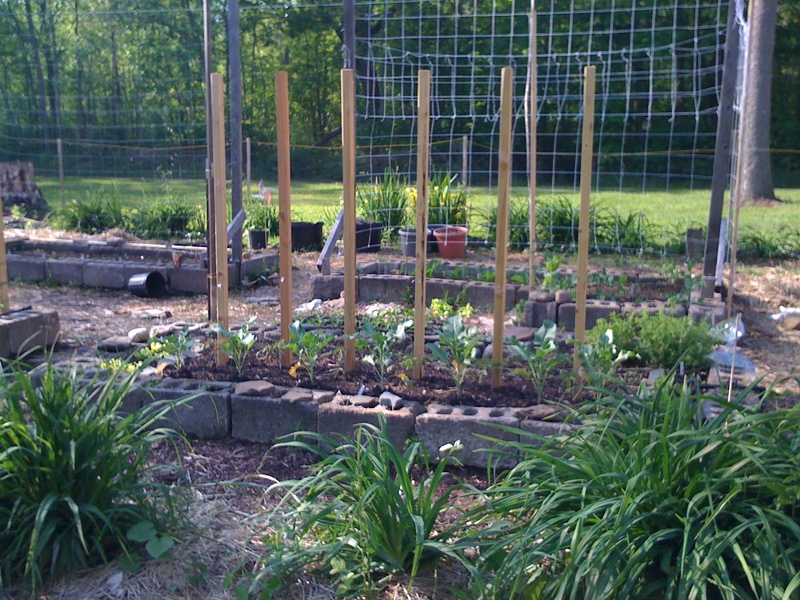 The garden is completely surrounded by deer netting. How did it or they get in there? 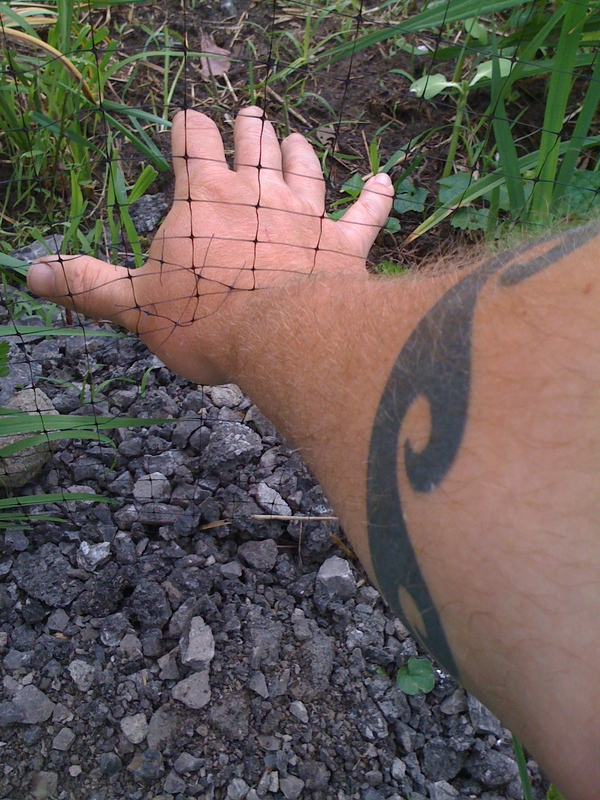 I thought maybe the critters were actually trapped in the garden. One year I did find one living in a Tomato bush. 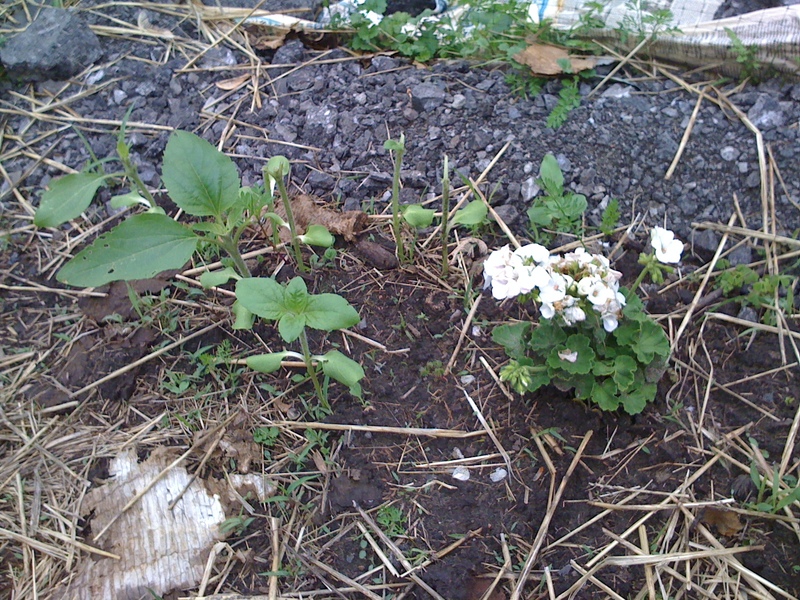 Miro, my beagle, took care of the infiltration. Miro is long retired. He’s over 13 years old now. So I brought Sidney, my shepherd, into the garden to sniff out the situation. Trouble is, she isn’t a hunter. She finds the culprit but tries to befriend it. I can’t have her fraternizing with the enemy. I then found the access point. The little jerks had chewed a hole in the deer netting. In fact they chewed several access points in 4 different areas and only ate what was on the other side. They didn’t move about the garden at all. I had some chicken wire on hand so I cut it into long lengths at 12″ high. I wrapped that around the garden and so far have had no problems. In the past I’ve had success with garlic pepper spray and dried blood. I didn’t want to buy any dried blood but I quickly went in to make some garlic pepper tea since the Hostas were now under attack, also. Garlic Pepper Tea is easy to make. 6 cloves of garlic, 4 cups of water, 2 teaspoons of cayenne pepper. You can use chili powder too. 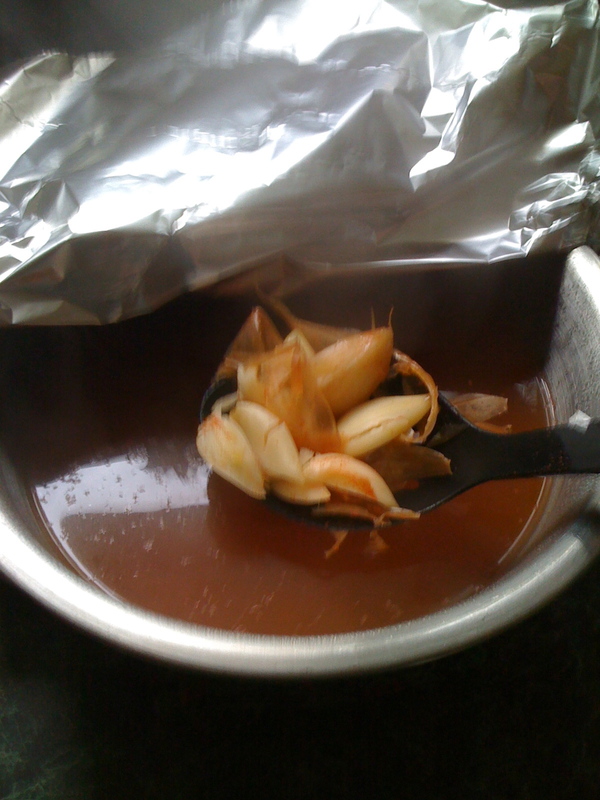 I also crush the garlic to make the oils steep more thoroughly. 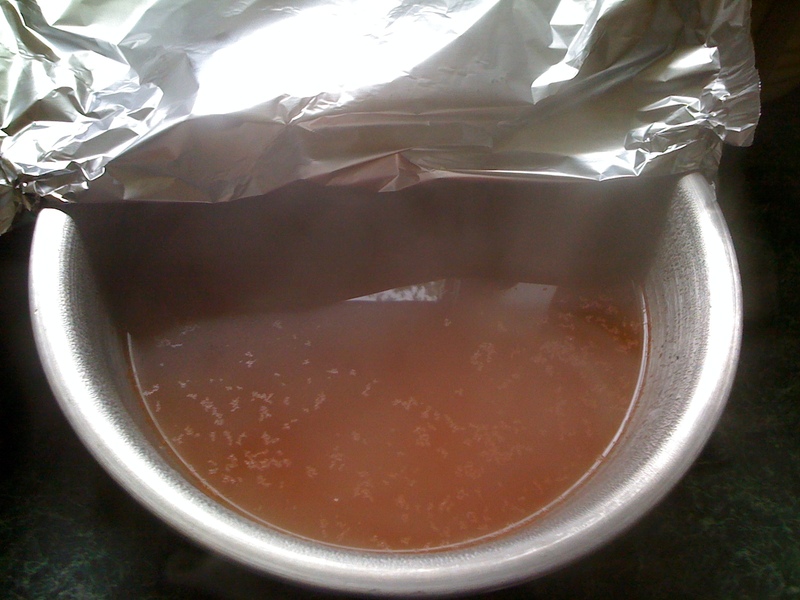 Bring the water near a boil then remove from the heat. Toss in the garlic and pepper. Let it steep for 2 or 3 days. Warning, it will clog a sprayer. So after 3 sprayers, I now use a plastic bottle that I poked a small hole in the top. It’s easy to clean and works really well. I tasted it. It’s delicious. Luckily, the critters hate it. 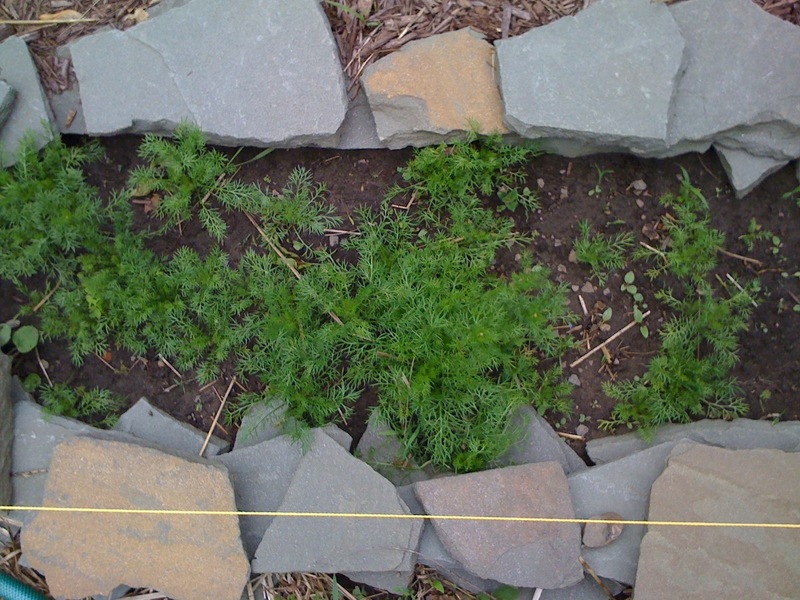 The Chamomile bed is filling out nicely. I’m pretty excited to see flowers now that buds are forming. I love Chamomile tea with buckwheat honey. Another great use for Chamomile tea is as a mild fungicide. It helps prevent dampening off, the white fuzzy stuff on new plants after seeds emerge. I’m past that point now, so I’ll gladly drink mine. It should continue to provide flowers as long as I continue picking them. It should also reseed itself and come back next season. 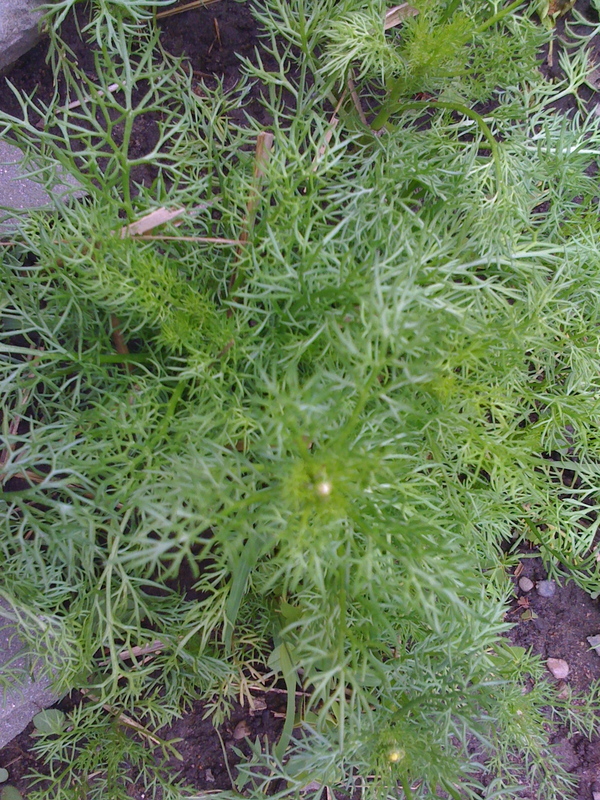 Chamomile Buds. We’re close to seeing some flowers. 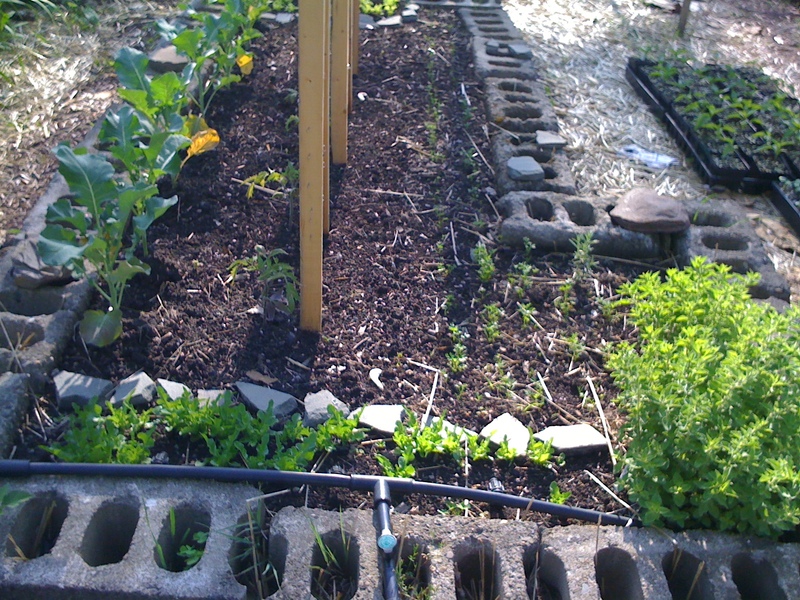 Pictured here in the front bed is Oregano, Lettuce, Carrot, Rosemary, Gilbertie Tomatoes, Broccoli, and Onions. 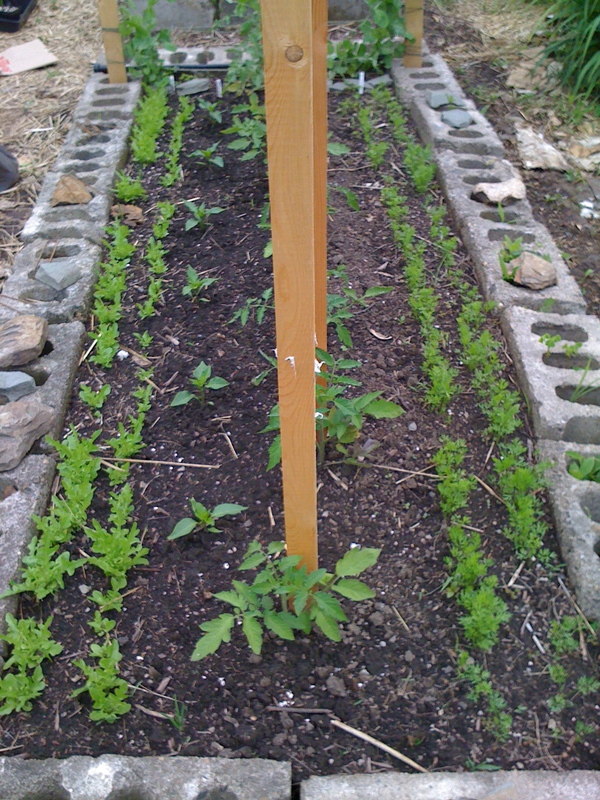 Pictured in the middle bed are Amish Paste Tomatoes, Lettuce, and Carrots. 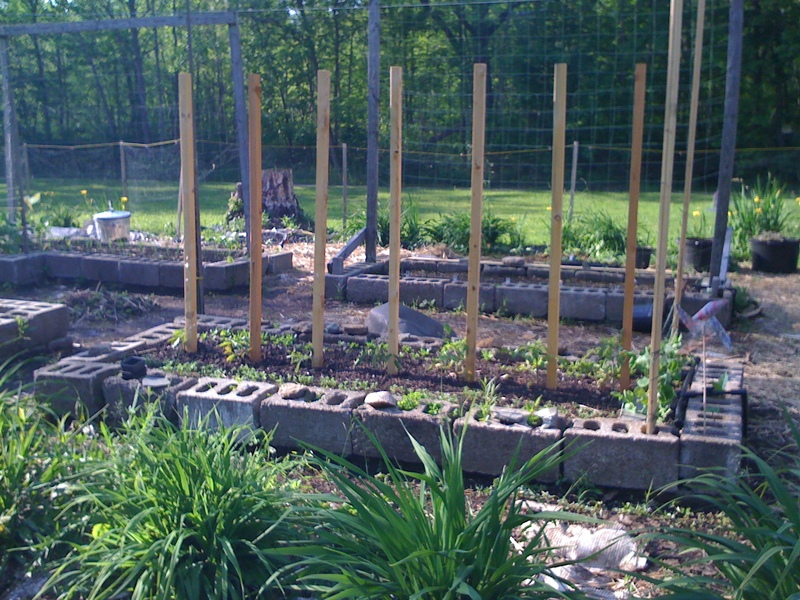 Since this picture was taken I’ve planted Yellow Hot Peppers. 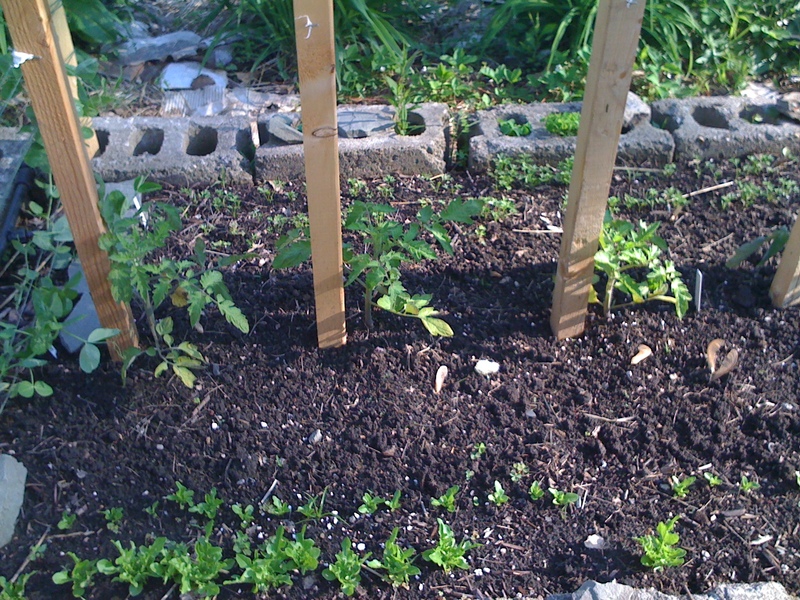 Here’s the other end of the front bed with the Gilbertie Tomatoes and Broccoli. There’s a bit more Lettuce right there on the edge. That particular type of Leaf Lettuce is my favorite. 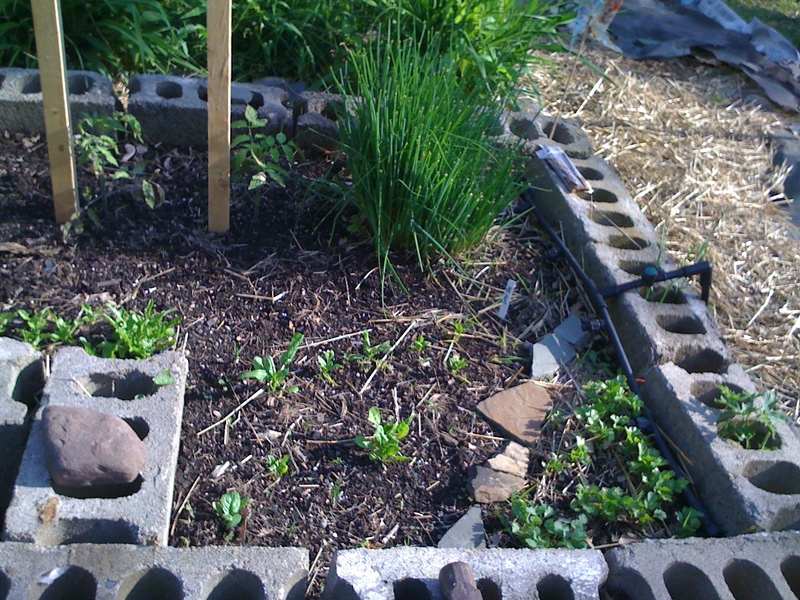 Picture here in the end bed is Garlic Chive, Onion, Hot Oregano, Arugala, Amish Paste Tomatoes, Onion Chive, Spinach, and Cilantro. 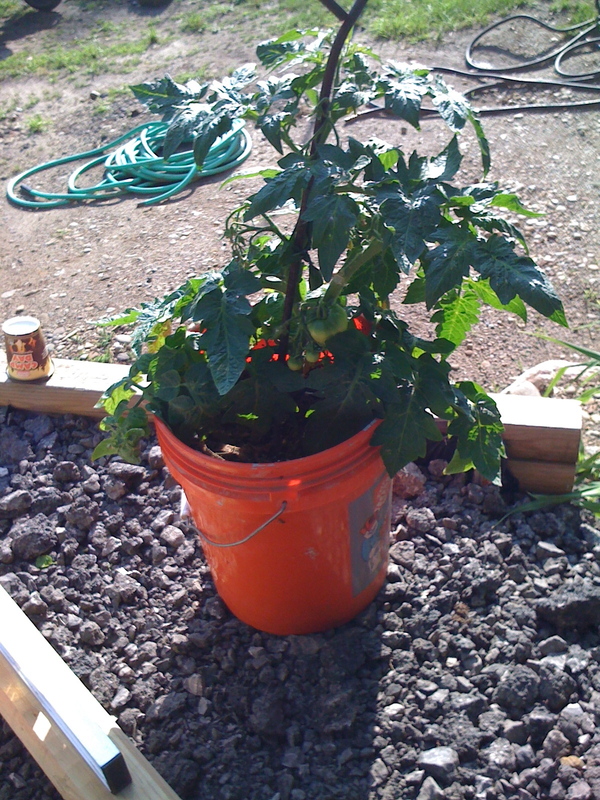 Since this picture was taken I’ve planted Purple Bell Peppers. 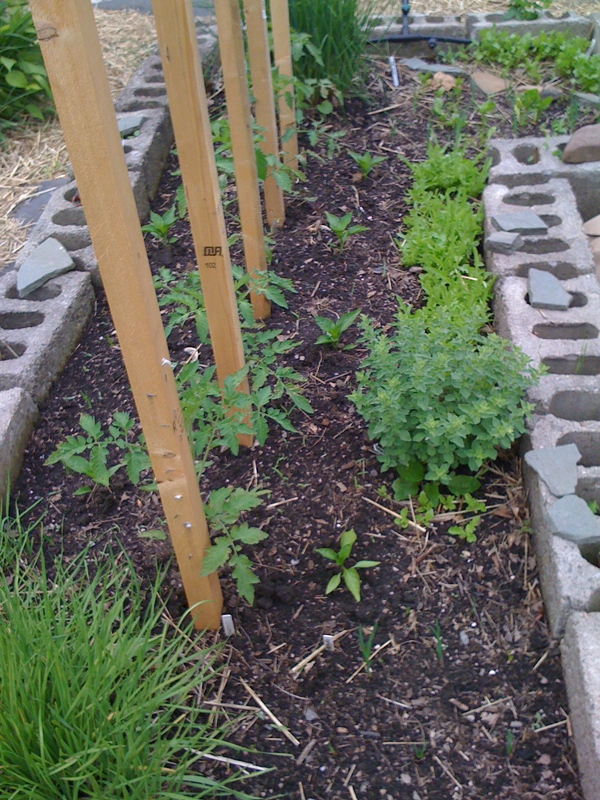 Here’s a look at the far edge of the far bed where the Amish Paste Tomatoes are. That’s the Onion Chive, Spinach, and Cilantro. 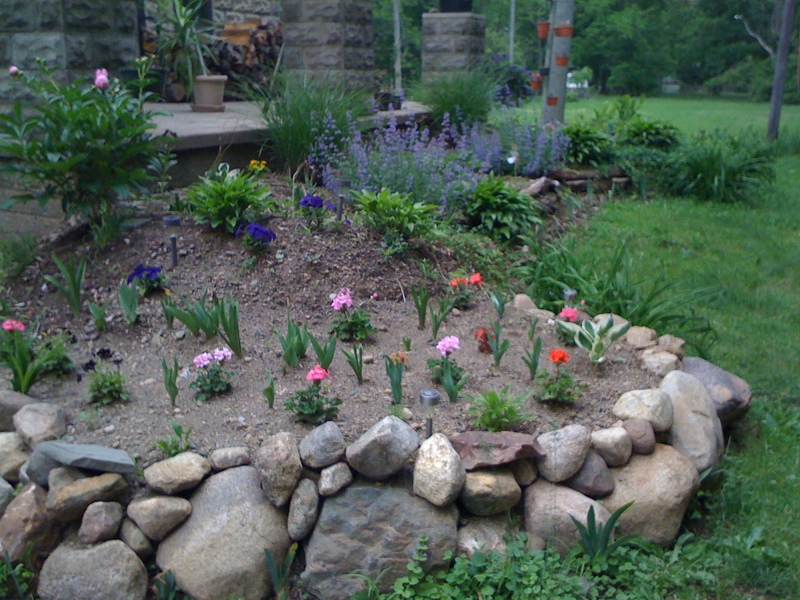 Another look at the end bed over the Daylily. Same look at the middle bed. 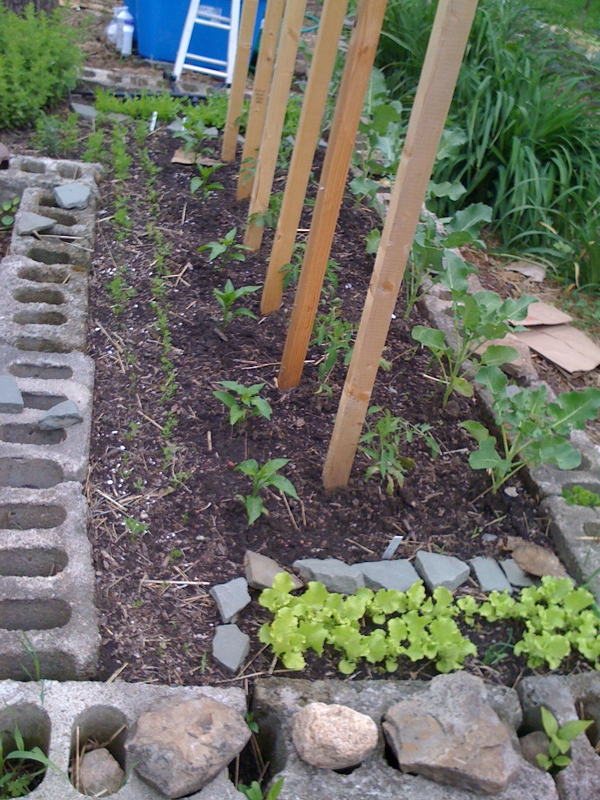 …and the same look at the front bed. That’s the Broccoli right up front. 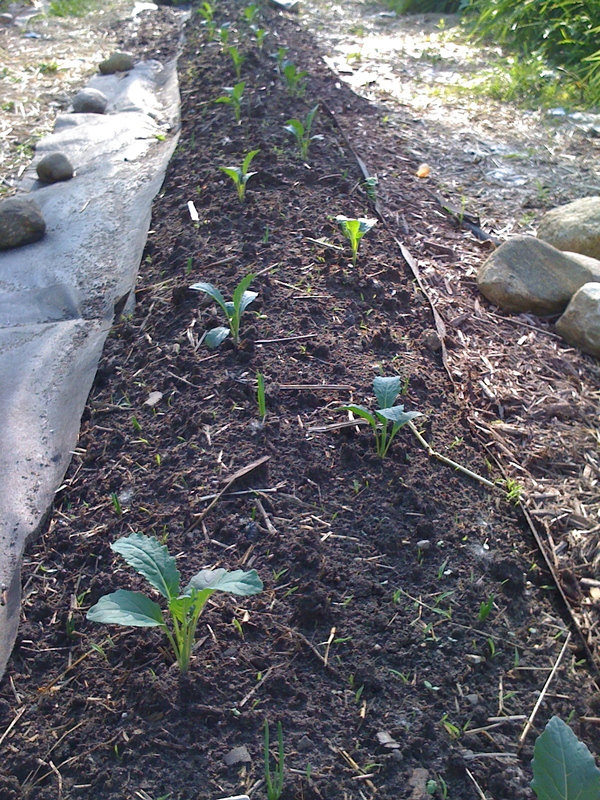 Jalapeno plants added to the first bed. I am growing abut 16 Jalapeno plants hoping to make some Chipotle as well as salsas, stuffed peppers, and I even mix some in my homemade, dill relish to give it some zippity doo da. Here are the Yellow Hot Peppers I added to the middle bed. The last bed has the Purple Bell Peppers in it. The farm we belong to gave us a patio Tomato. I am unsure what it is. It looks like a beefsteak type. It was root bound in a small pot so I transplanted into a 5 gallon bucket. 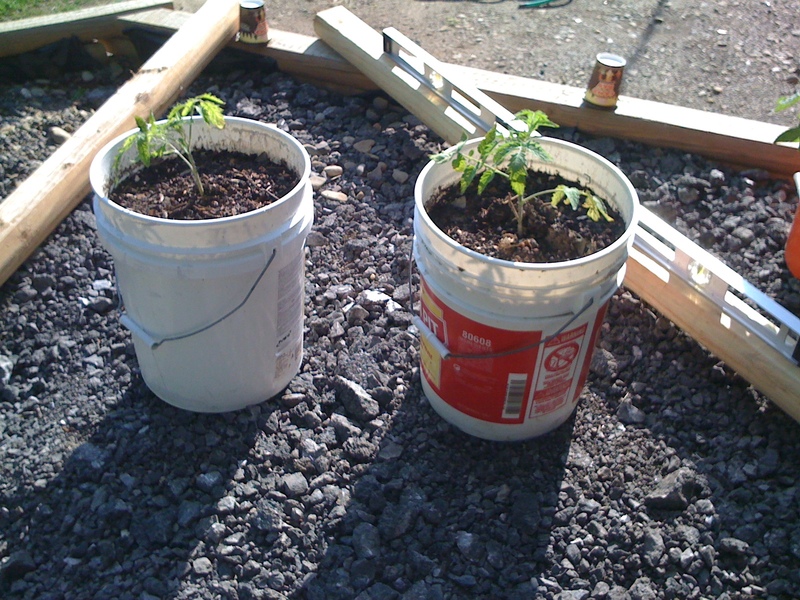 I had some extra Tomato plants and the buckets so I tossed them in with some compost and bulk soil. They’re saucing type but not sure exactly what. 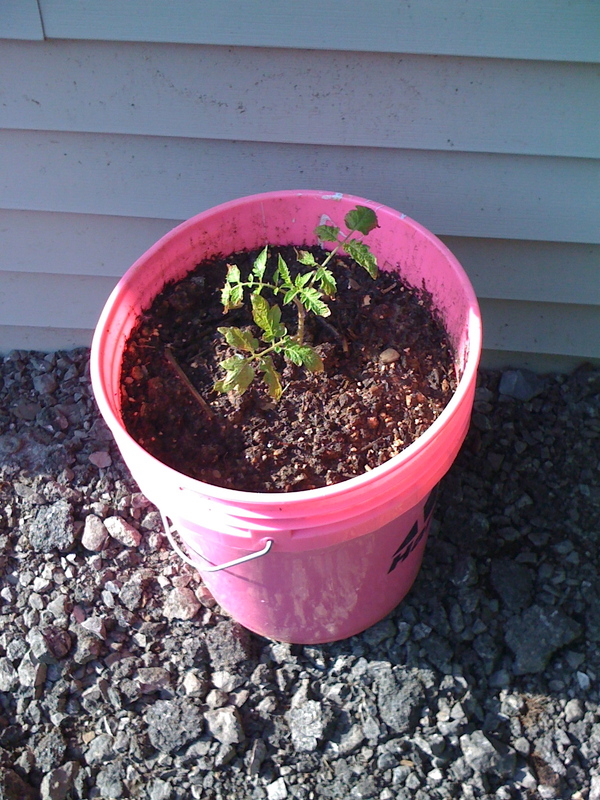 This is an extra Tomato plant in my breast cancer awareness bucket. 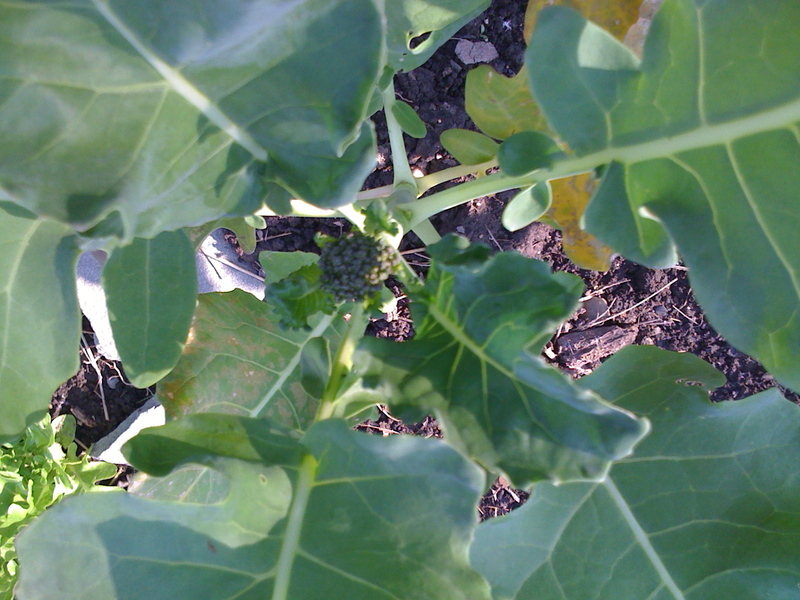 Here’s the first Broccoli crown showing. I noticed several others showing now, also. There are 3 that aren’t yet. Here’s the first Snow Pea flower of the season. I saw a few others since then. 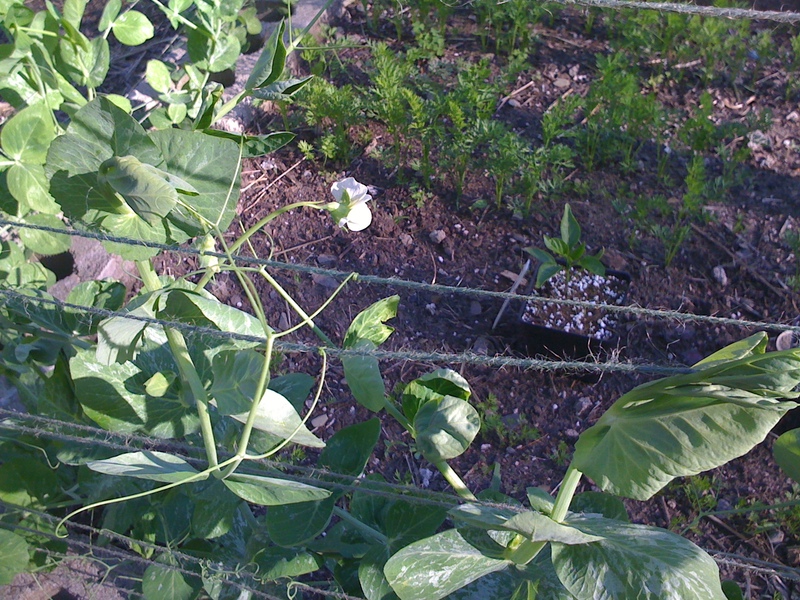 In a couple days we’ll be picking Snow Peas. Can’t wait. Gonna be lots of them. 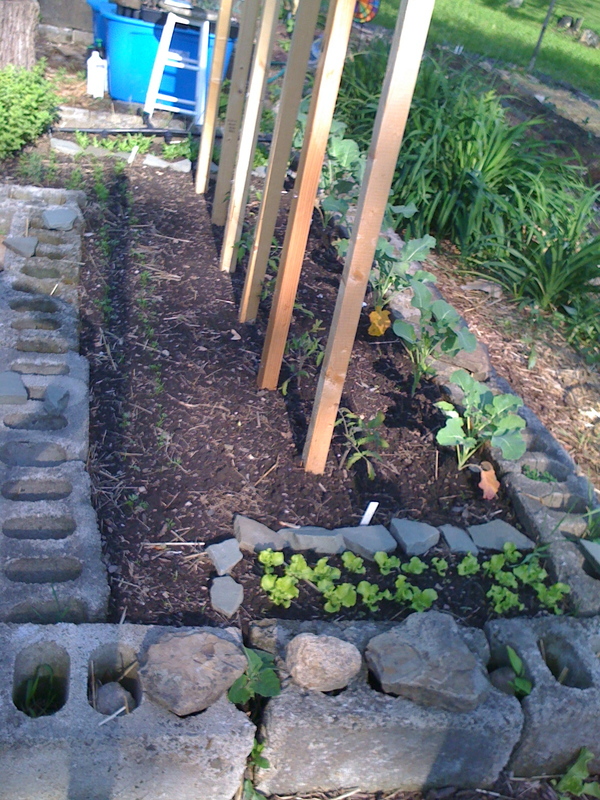 25 Kale plants and they’re surrounded by lots of Onions. My Walla Walla didn’t live so I bought Onion sets from a local farm market. I bought Vidalia, White, and Red. I probably have 125 or so planted between all the beds. 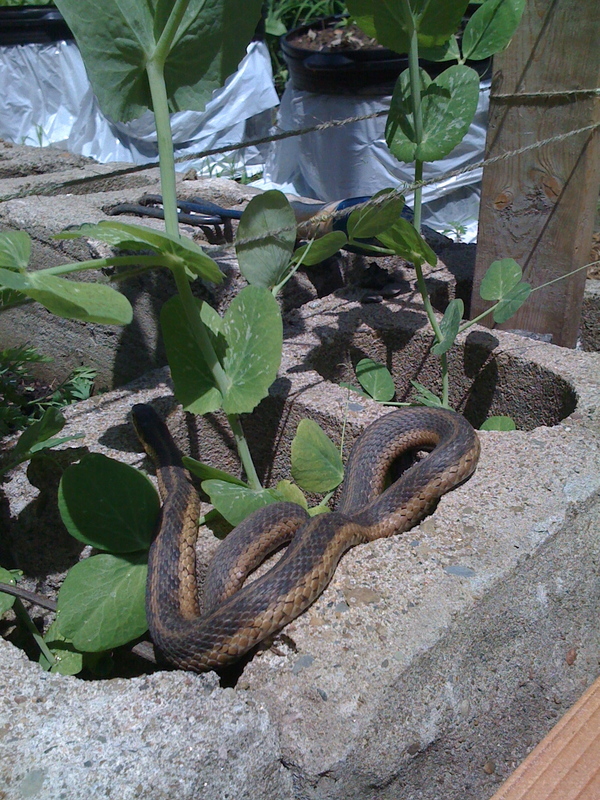 There are a few snakes in the garden this season. Sadly, Miro killed one. This one is my buddy. He isn’t afraid of me anymore and sits there in the sun while I work. On several occasions I didn’t notice him at first. He doesn’t move. 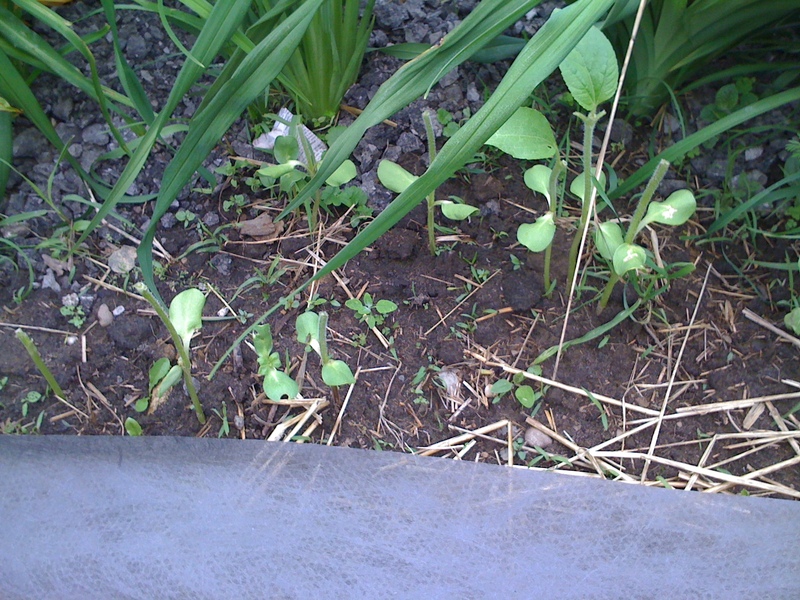 But then I catch a glimpse of him, this time, only 2 feet away from where I was weeding. It’s really cool how animals learn that I’m not a threat. At the end of the season when the Sunflowers are seeding, the yellow finch will land on the face of them right next to me. 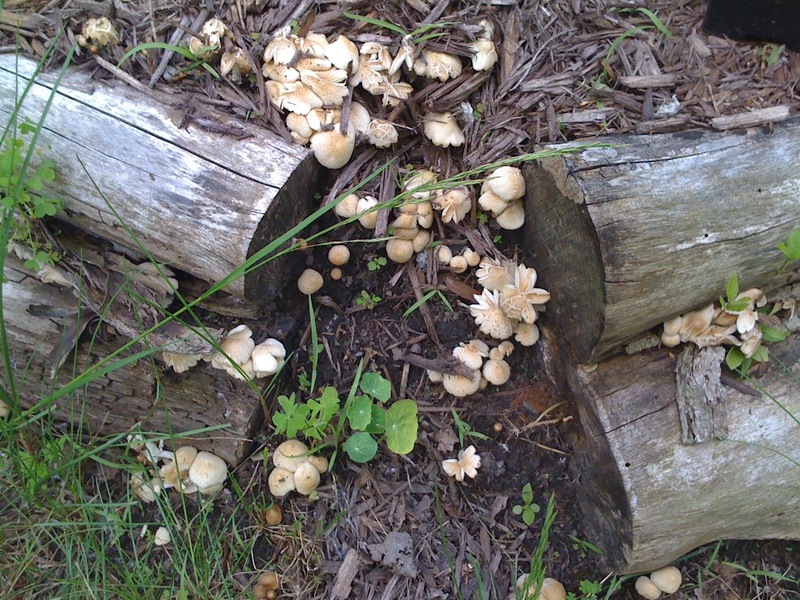 I noticed mushrooms growing around the herb garden. I don’t really know what they are but I got rid of them promptly. 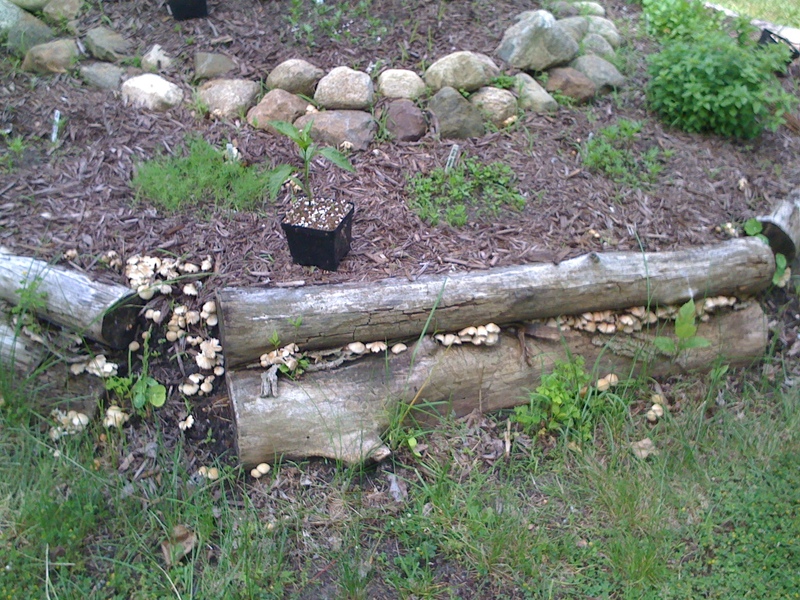 That’s a Nasturtium in the middle of the mushrooms. 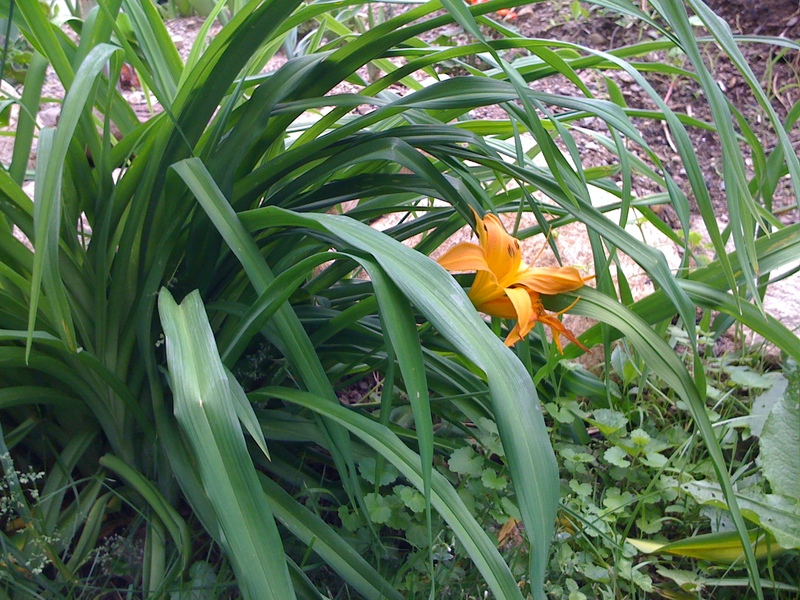 How strange is it that we see a Daylily already? None of the other Daylily, and there are many, even show buds yet. This one flowered already. Usually it’s a race to July 4th to get some. I think this plant got stressed because of the new stone work that was done and it was hurrying to seed. That’s the only thing I can think of. Nonetheless, it’s beautiful. Can’t wait til the hundreds of others come in. 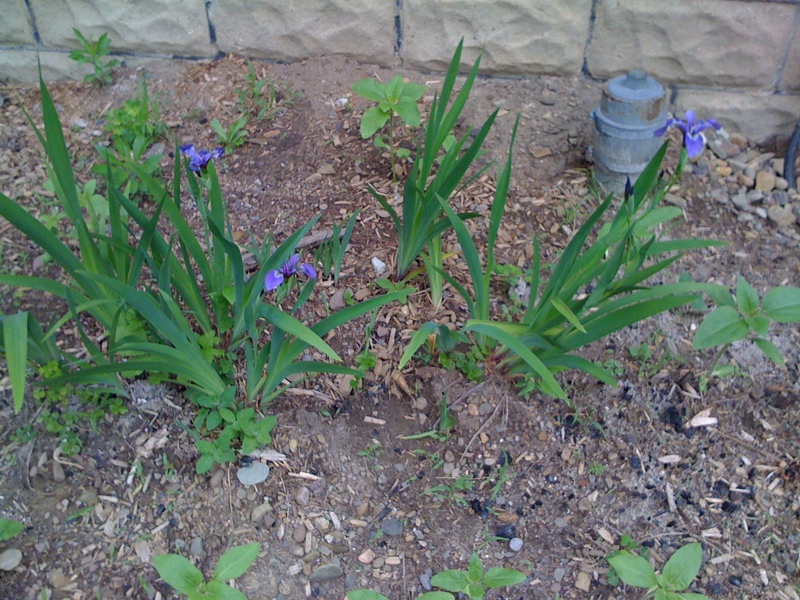 Most of my Iris are yellow. It’s neat to have a few purple ones. I need to propagate these and mix them in with the yellow. 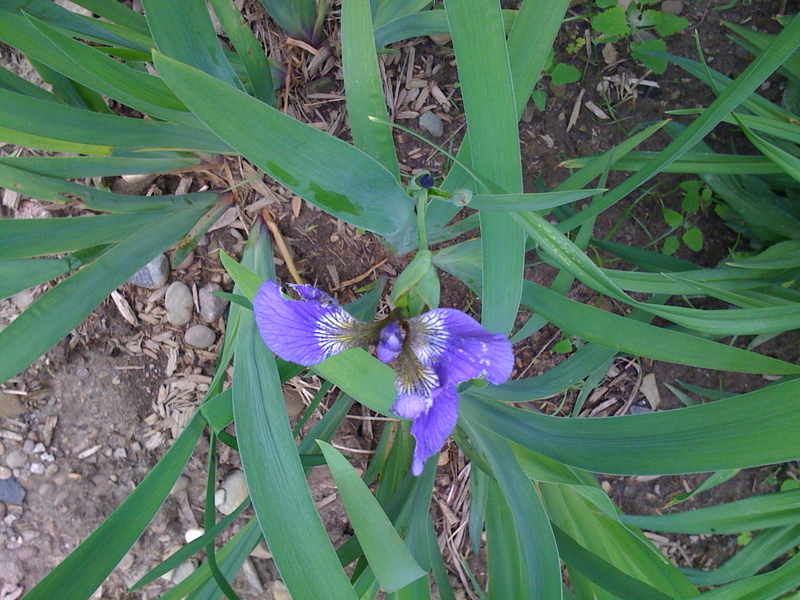 A close up of the purple Iris. 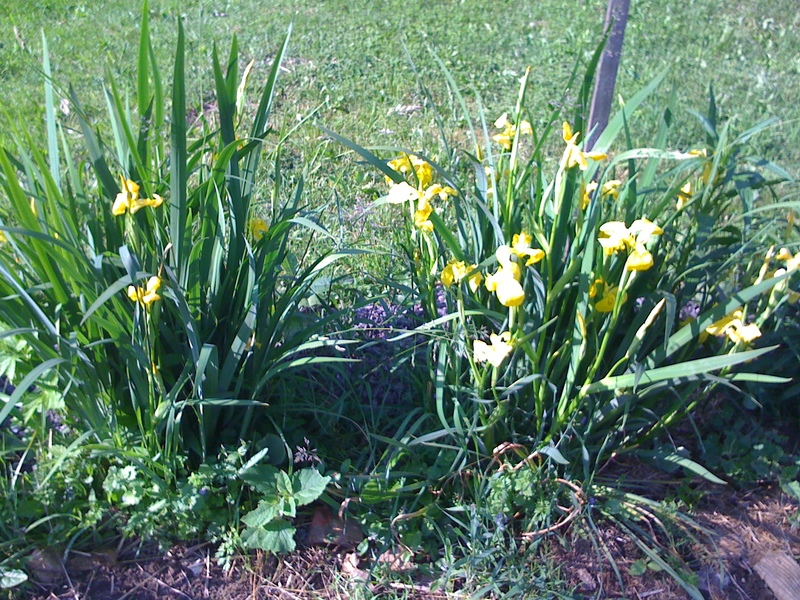 Here are a few yellow Iris in the garden area. 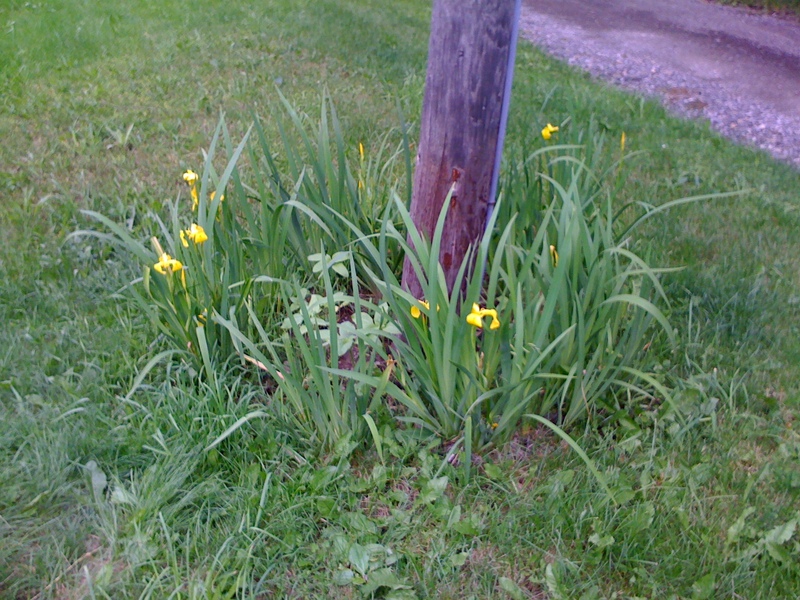 …and more yellow Iris around the telephone pole with Sunflowers. 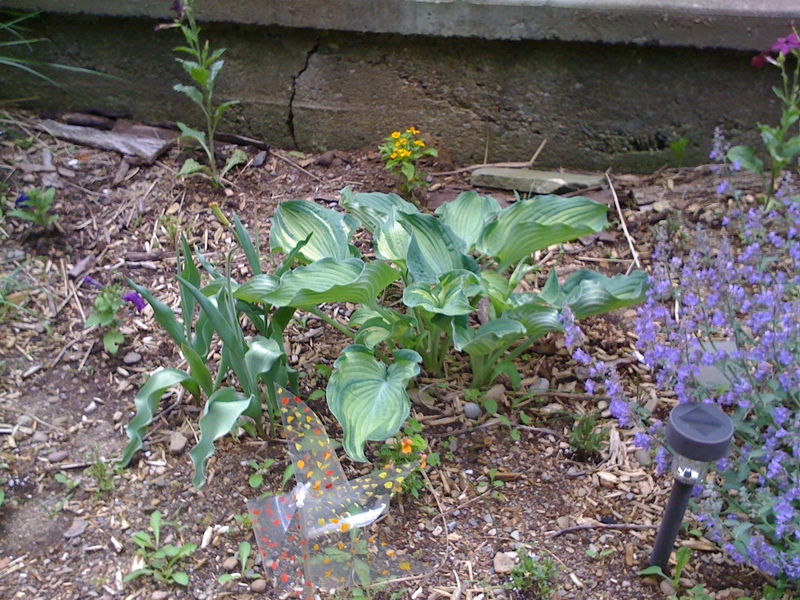 The giant Hosta is getting big as the Tulips die back. I see the start of some flowers already. 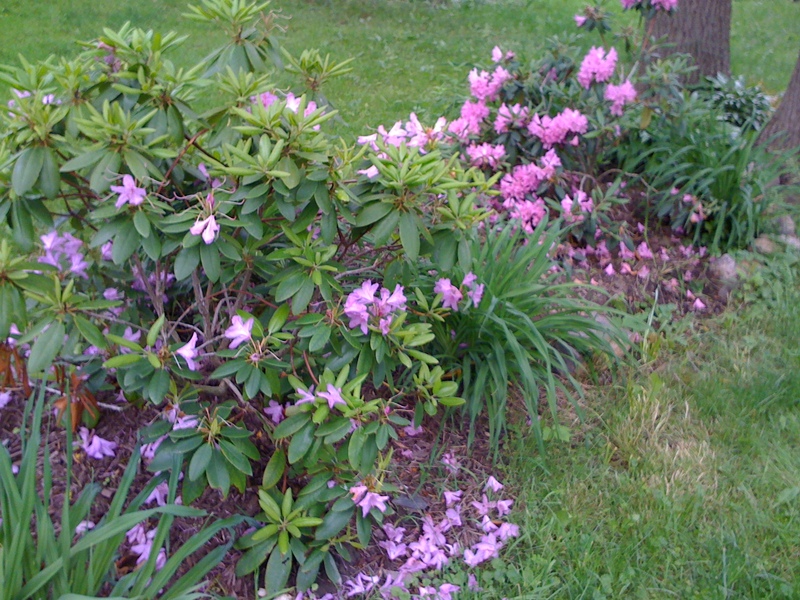 The 2 Rhododendron are starting to wrap it up. Notice the new growth on them? All that fresh green is new since moving them a few months ago. I think they love the new digs. 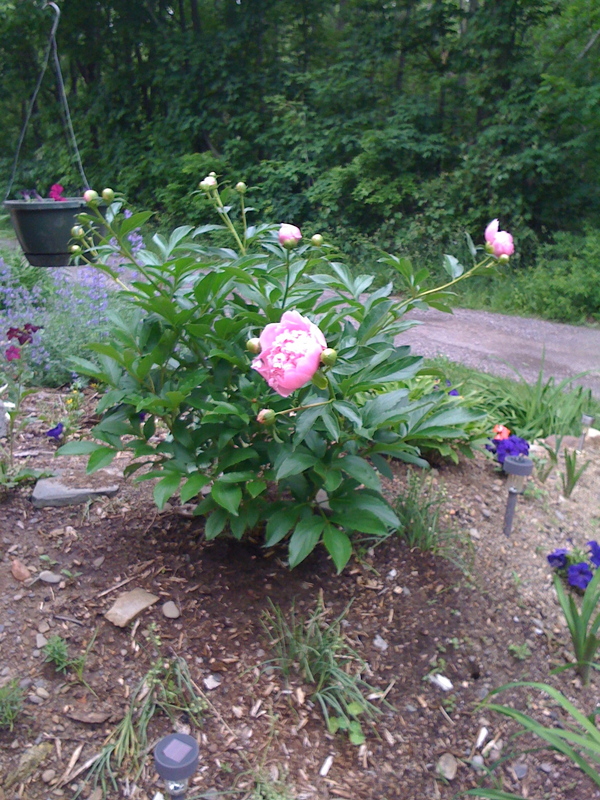 The Peonies are open and getting heavy. Today while it was raining there were a few others open and they’re all laying on the ground. I saw a few others in town today and they are also on the ground. Next season I’ll stake them. This is where one of the Rhododendrons used to be. We just planted Petunia and Geranium as the Tulips and Hyacinth die back. It looks awkward at the moment until it fills out. 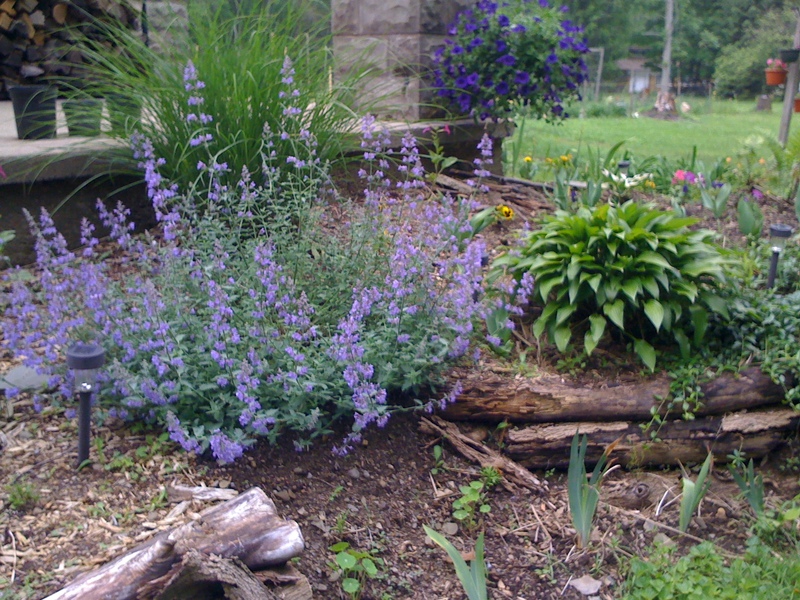 The Purple Sage is going nuts even though I cut it in half earlier this season. 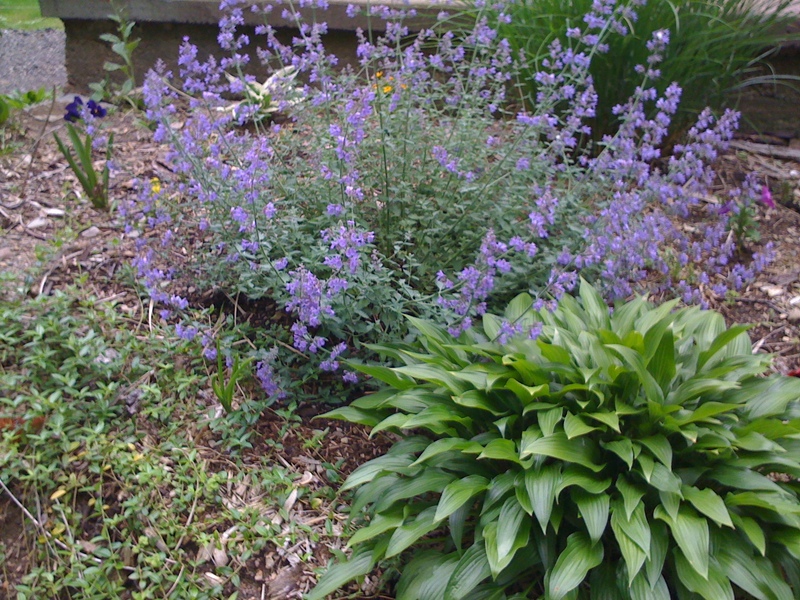 Here’s the other Purple Sage that’s also going crazy. I don’t know if I’m working any concerts this weekend or not. I am tomorrow for sure. 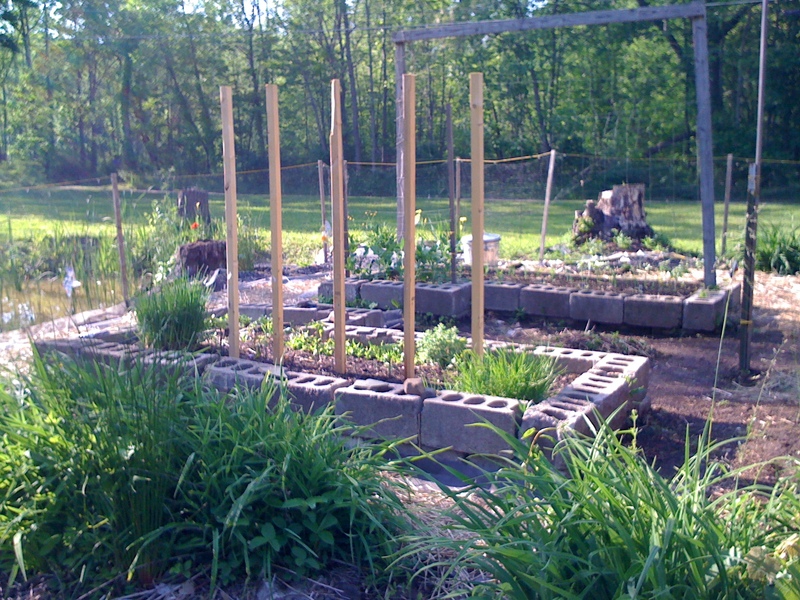 If not, I still have Winter Squash and Pumpkins to get in the ground. 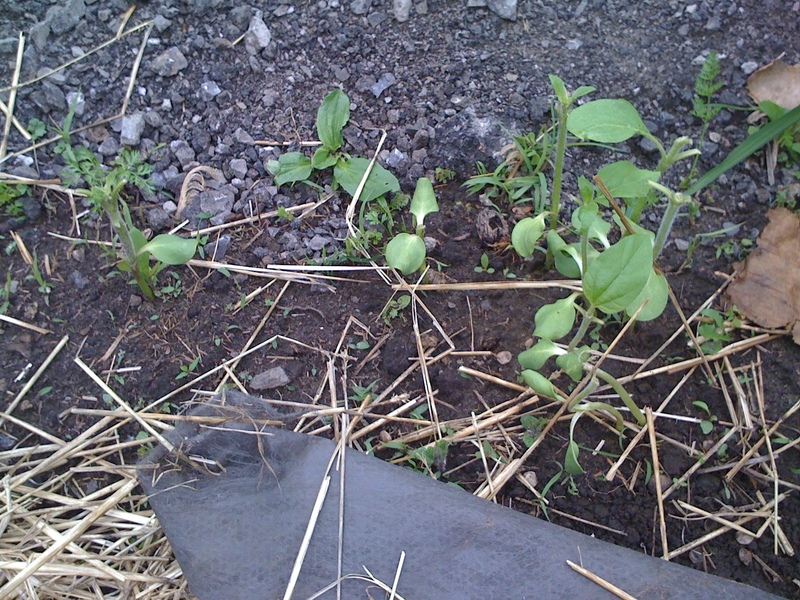 I also have Summer Squash, more Melons, and more Sunflowers to get in. I haven’t prepared the soil for them yet, either. Ugh. I did manage to get the rest of the Peppers in, Birdhouse Gourds, and a few random Pyrethrum Daisy, African Daisy, and Shasta Daisy beds as well as Pole Beans. 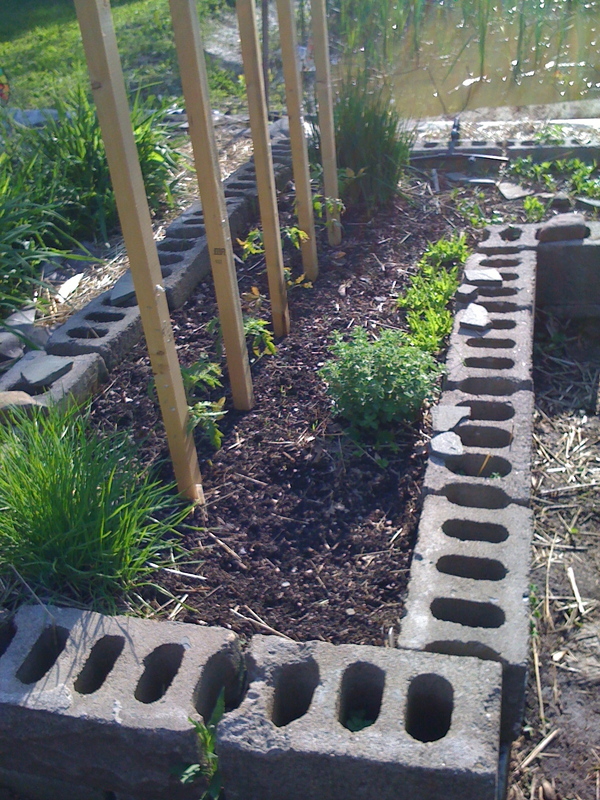 The more you grow, the less you mow.™ Eat My Plants!